The San Diego Chinese Women's Association invited the San Diego Chinese Choral Society to perform at their first annual Holiday Tea, at the Carmel Mountain Ranch Country Club. Picture gallery at the Five Continents and Four Oceans website, courtesy of Mr. Wu Song. 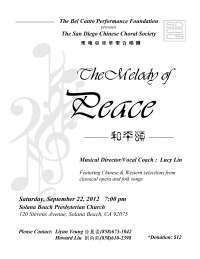 On Sept. 22, 2012 the San Diego Chinese Choral Society performed a concert, titled "The Melody of Peace," at the Solana Beach Presbyterian Church. 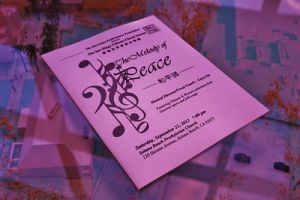 Guest performers included Mario Olivares (guitar), Xiaonan Zhang (erhu), Weiping Wang (dulcimer) and Janine Yang (flute). Photographs from this concert provided by Alan Su Photography. Click on the small images to view as large pictures. Mouseover the large pictures for additional options. Picture gallery at the Five Continents and Four Oceans website. 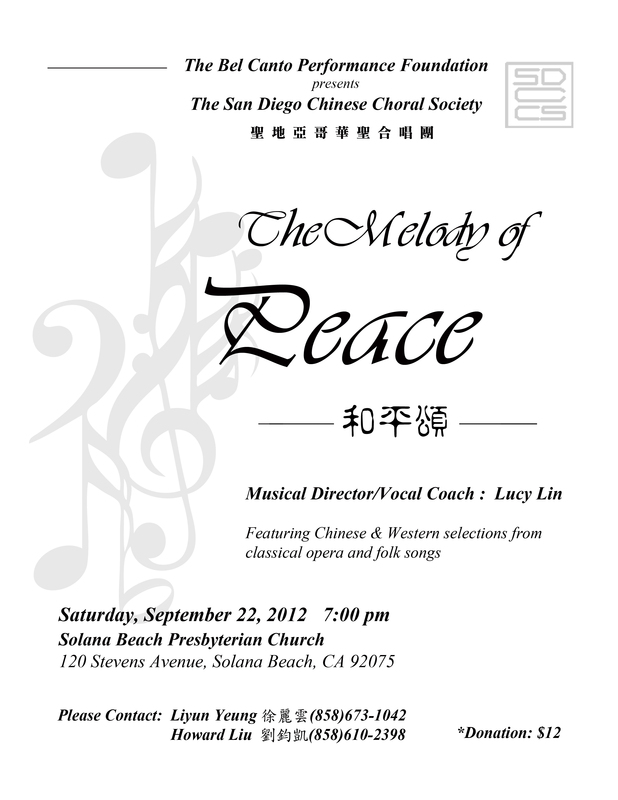 The San Diego Chinese Choral Society will hold a performance, "The Melody of Peace," at 7 PM on Saturday, September 22 at the Solana Beach Presbyterian Church (120 Stevens Ave., Solana Beach, CA 92075). For tickets, please call 858-673-1042, or 858-610-2398, or email the webmaster. Suggested donation: $12/ticket. The Schedule page has also been updated with the remaining extra rehearsals leading up to the concert. 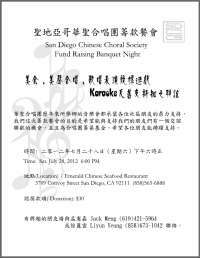 The San Diego Chinese Choral Society will hold a fund raiser banquet at 6 PM on Saturday, July 28 at Emerald Chinese Seafood Restaurant (3709 Convoy Street, Suite 101, San Diego, CA 92111). Tickets are $30 each, covering the cost of dinner and entertainment by the SDCCS. A karaoke fund raiser will also be featured at this social event, and everyone is invited to attend. If interested, please reserve tickets by calling Mr. Jack Meng / 孟憲嘉 (619.421.5964) or Ms. Liyun Yeung / 徐麗雲 (858.673.1042). 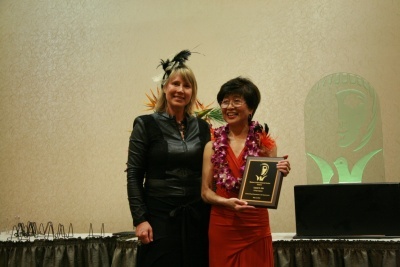 On May 5, our musical director, Ms. Lucy Lin, was awarded at the Women's International Center's 27th annual Living Legacy Award ceremony, recognizing her many accomplishments over her long career as a vocalist and instructor. On behalf of the San Diego Chinese Choral Society we congratulate her for her achievement.